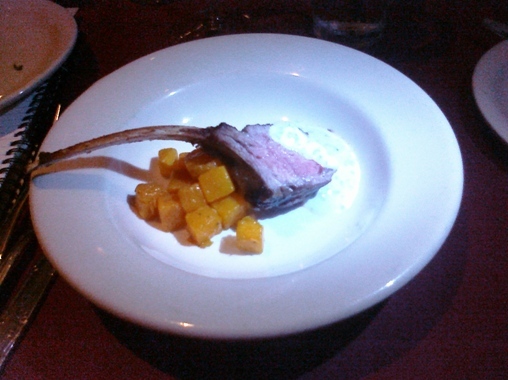 2005 Domaine Terlato-Chapoutier, Australian blend of Shiraz and Viognier paired with a perfect lamb chop sitting on diced butternut squash and complemented with a mint yogurt sauce. A spicy Shiraz from the vineyards of Central Victoria brightened with a boost of Viognier for aroma and balance, as often practiced in the Côte Rôtie. The grapes grown in this Austrialian vineyard were planted on 19th century French rootstocks, another nod to the French tradition & influence in this new world wine. This wine is a collaborative effort between two renowned wine families; Chapoutier from the Rhône Valley in France, and Terlato family of Napa Valley in California. Delightful! 2009 Ridge Geyserville, Alexander Valley, nominally a Zinfandel, but really an interesting blend of 74% Zinfandel, 17% Carignane, 6% Petite Sirah, 2% Alicante Bouschet, 1% Mataro (Mourvedre), paired with seared duck breast on a bed of linguini with a highly spiced marinara sauce. Saturated ruby color. Deep cherry/plum fruit, black tea, pepper/clove spice, gravel, tar, mint. Satin tannins. Opulent, balanced, wonderful. Loved this wine - and took the balance of a bottle home. We snuck in a bottle of 2008 Shai Cellars Adome, because winemaker Shawn Shai Halahmy likes to keep things interesting. 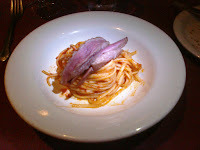 It was delicious with the remaining pasta, and amazing with the following pork belly! 2008 Cosentino Winery CigarZin, California, paired well with pork belly, goat cheese polenta and an interesting combo of golden beets, parsnips and carrots. 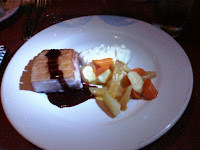 Interesting folks at the table included Stephanie Luros-Gilbert of Vin Dame Tours & Events. Check out the website! 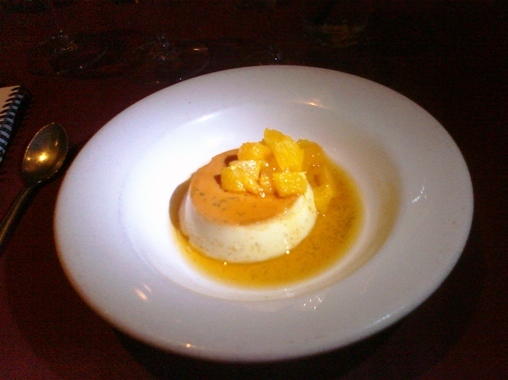 Dessert was flan in a citrus sauce paired with Dow's 20-year-old tawny Porto. Aromas of toffee, roasted nuts, orange peel in the nose. Citrus notes of orange and tangerine in the mouth. Finishes clean and long, with hints of smoked nuts and marzipan. A perfect pairing! 2010 Tablas Creek Patelin de Tablas Blanc - OK, so not SO obscure. We're big fans of Tablas Creek, and tasted this wine earlier this year at the Rhone Rangers Los Angeles event in August. We still like it a lot. (89 Points: Wine Advocate) The 2010 Patelin de Tablas Blanc (50% Grenache Blanc, 33% Viognier, 10% Roussanne, 7% Marsanne) shows the richness of Grenache Blanc in its white peaches, flowers and jasmine. It is a beautifully delineated white, as well as a terrific value. Now focused on final details for Cooking for Love coming up on October 9th. Hope you'll consider attending - it benefits Break the Cycle, a non-profit group dedicated to breaking the cycle of family and relationship abuse. Lots more events and good times upcoming. Stay tuned for more adventures of the Goddess & her trusty sidekick JD! Cheers! Exciting news from Four Brix Winery!